"I wish to sell the plantation on which I now reside, known as Burleigh. The plantation contains about 3000 acres, a good proportion of which consists of creek bottom of the finest quality, as Tallahala creek runs through its entire length. I desire to affect the sale by the first of December next. The dwelling house is probably the best in the county, with suitable offices; and there are ample quarters on the plnt [an abbreviation for 'plantation'? ], most of them new [??] and used framed cottages. If a purchaser to the whole tract cannot be readily found, I will endeavor to accommodate such persons as may wish to purchase small tracts. Thos. S. Dabney. 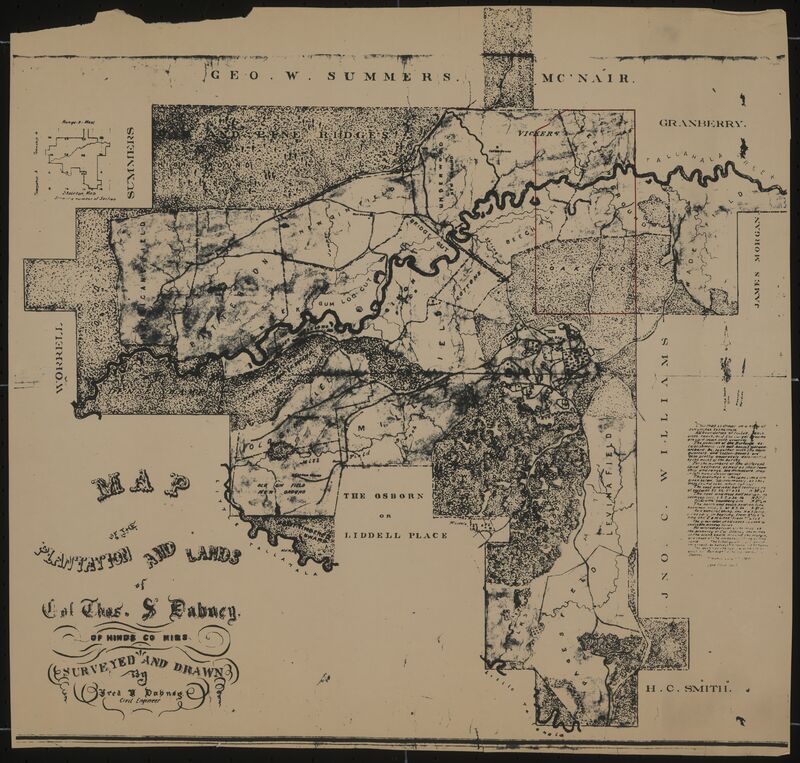 Oct. 15, 1879"
Map of Burleigh by Fred Y. Dabney, 1860. "Map of Plantations and Lands of Col Thos. S. Dabney, of Hinds Co. Miss, Surveyed and Drawn by Fred Y. Dabney, Civil Engineer." The house itself is labeled "Burleigh" just to the east of the image center (at pixel coordinates 3817 from left, 2392 from top). Most of the text is readable if you magnify the map; one way to see the map detail is to right-click the link above, download the map, display it in your favorite image viewer, and magnify. The image is about 3.75 miles wide. See below for a version of the map registered to Google Earth. The original of the map is maintained by the University of Virginia Library Special Collections. See this link for the wording of the legend on the right of the map. Google Earth Download. Free download of Google Earth for viewing the map overlays. Dabney Map Overlay for Google Earth. This is the Dabney map above overlaid on Google Earth by James Drake. Burleigh Features as Google Earth Placemarks. This is a collection of Google Earth placemarks, showing the location of the main house, stables, school, etc. James Drake extracted these features from the Dabney map using a 1860-era hand-drawn copy on which the labels are more decipherable. You may want to display the Dabney overlay above simultaneously with this collection of placemarks. Township and Section Overlays for Google Earth. These township overlays allow you to match modern section boundaries to the 1860 map. Tallahala Creek and Little Tallahala Creek Overlays for Google Earth. This is a bright green trace of the creeks in the area of Burleigh. Highlighting the creeks facilitates map registration. USGS Topological Map Overlay for Google Earth. This shows the Little Tallahala Creek (which is only partially visible on Google Earth).